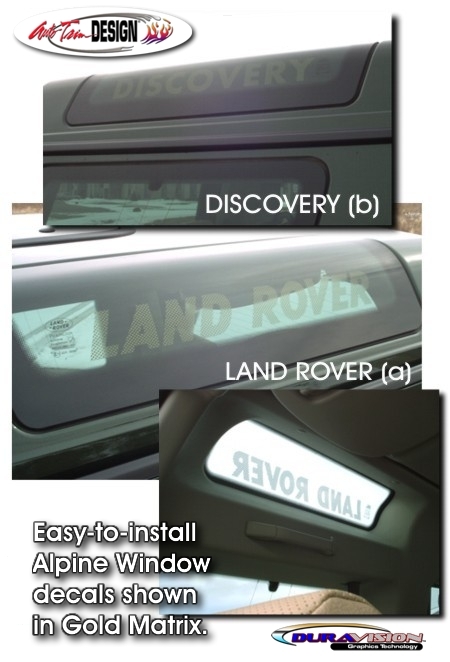 Personalize your Land Rover Discovery with one of these uniquely designed decal sets that fit perfectly in your upper rear Alpine Windows. Each decal set is made to be installed on the INSIDE of the windows - away from the exterior elements. Manufactured with our DuraVISION dot matrix technology, the decal lets the light in while at the same time creating a unique image that can be viewed from the outside. Packaged in a set of two (2), choose one (1) of the the two (2) designs shown in a variety of colors. Includes easy-to-follow general online instructions.